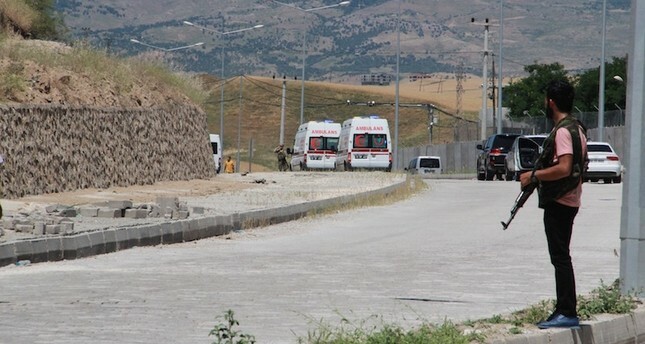 A young teacher was killed and three others wounded Friday in separate PKK attacks in the Kozluk district of Turkey's southeastern Batman province. PKK terrorists initially fired shots at a car carrying lawyer Muhammet Işık, the nephew of the Municipality President Veysi Işık. Işık was not wounded in the attack, which was carried out from another vehicle. Teacher Şenay Aybüke Yalçın, traveling in a third vehicle at the scene, was killed by the gunfire, and another teacher in the same car was wounded. 22-year-old Yalçın made a Facebook post in October celebrating her appointment as a music teacher to a public school in Batman. Prior to the shooting, a vehicle filled with explosives was used to attack a police station in the district, wounding three people. Ambulances and security forces rushed to the scene following the car bomb explosion. One civilian and two soldiers were injured in the attack. The wounded were immediately taken by ambulance to the Batman Regional State Hospital, where medical professionals treated their injuries. Images from the scene show that the explosion blew a crater in the ground outside the police station and broke the windows of homes and workplaces across a radius of around 1 kilometer. Security forces have cordoned off the scene and begun their investigations. First indications suggest that the PKK terrorist organization targeted the police station with the explosive-laden vehicle. Upon reaching the checkpoint some distance from the police station, the terrorists detonated the vehicle. Security officials launched a widespread investigation to capture terrorists in the area following the incident, closing the Kozluk Batman motorway to traffic. Tensions were high at police station after the incident, with local citizens ignoring the police warning to vacate the area in case of a second explosion. When the citizens insisted on staying by the station, the police fired shots into the air to disperse the crowd. The PKK is listed as a terrorist organization by Turkey, the U.S. and EU, and resumed its decades-long armed campaign against the Turkish state in July 2015. Since then, the terror organization has been responsible for the deaths of some 1,200 security personnel and civilians, including women and children, while more than 4,000 security personnel and over 2,000 civilians have been injured.